This chapter presents a study of an online community for Swedish teenagers, an early social media. Their mobile use is analyzed and its relationship to current social media is discussed. Analysis of two months of log data and 100 surveys on teenagers' phone use showed that the phone use mostly took place during times of the day when teenagers have social time and was not influenced by the availability of a computer. The phone made the community access more private compared to the computer, but teens did share the use when they want to. The cell phone bridged the online and offline social communities and allows teens to participate in both at the same time. The online community was not only a place for social activity online, it was also a social activity offline that is carried out face-to-face with friends. Social media have become some of the most used digital services of our time, with Facebook and Twitter as perhaps the most iconic examples used daily from mobile devices by hundreds of millions of users. It is sometimes difficult to believe that that this has not always been the case. Just a few years ago we did not Facebook or Instagram all our social events. Since the first analysis of our data there has been a tremendous development of social media and mobile phone handsets. Therefore, we believe that the strongest contribution of this chapter is the perspective of how early social media was used on the mobile phones of the time, how quickly things have moved forward since, and that we can see the beginning of many trends when we look back. Looking at our results with the perspective of today, we would argue that it maybe tells us even more about its time today than what it did when we collected the data and analyzed it. Now it is much more obvious that this pointed in the direction where social media and current smart phones took us. To a frequent use of social services from mobile devices, to long periods of fiddling with our mobile phones on the couch, oblivious to our surrounding. We had no idea this would come when we started analyzing our data in 2009, but in retrospect the material show where the development was headed. Teenagers have often been early adopters of mobile technology, and many research studies have focused on their use of voice calls and text messaging, for example, (Grinter & Eldridge, 2001; Weilenmann & Larsson, 2001). The mobile phone has been shown to support teenagers’ privacy (Ling & Yttri, 2005) and to provide a means for absent teens to participate in social gatherings with friends (Ito, 2003). In 2008, we wanted to complement this body of research on teenagers’ cell phone use with a study of their mobile use of an online community. 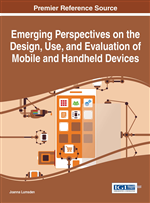 The purpose of this work was to inform design of future mobile services through the study of a large user population and a frequently used service. At the time, Facebook was in its infancy and not open to users from Sweden and the iPhone had just barely come out and started to transform our understandings of what the mobile phone would become. Cell phone penetration in Sweden was 100% in almost all age groups, but mobile internet use was not frequent, especially not among teenagers. We set out to study the mobile use of Playahead, an online community for Swedish teenagers. Playahead was chosen since it was an established community that had provided mobile access for more than five years and thus had a large community of experienced mobile users. Two months of log data from 2008 and 2009 was analysed with regard to the use rhythm; and 100 surveys collected to gather information on use situations. The use rhythm served as a foundation for exploring the relationship between Internet access from cell phones and location, computer access, and privacy. Here, the rhythm of user actions not only reveals the temporal pattern of teenagers’ Playahead use, but also informs us on their social and spatial context. Our findings from log data show that the cell phone use rhythm reflected the day with low activity during the night, a rise in the morning and during the day, and a distinct peak in the evening. Week days and weekends differed from each other. Surveys show that Playahead users often accessed Playahead from the phone together with friends. The cell phone allowed them to participate and be active at an online third place at the same time as they were active in an offline third place. Thus, accessing Playahead from the cell phone was not only a way to get access to the online third place, it was also a social activity carried out face-to-face with friends.